When it comes to black mold removal in your Atlanta, Georgia, home or business, leave this important task to the trusted professionals at Abatement Solutions Inc. Chances are, you’ve heard about the dangers of black mold. This especially hazardous type of mold has gained a lot of attention recently, and for good reason. It can irritate your allergies as well as cause a range of serious health problems, especially for those susceptible to illness, such as seniors. Unfortunately, buildings in the Southeast are at an exceptionally high risk for black mold growth. The region’s high humidity and the prevalence of basements and crawlspaces throughout the area provide fertile ground for black mold to grow. 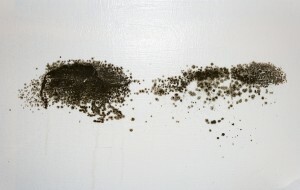 So, if you’ve seen black spots, noticed a musty smell, felt ill for an unidentified reason, or had a water leak inside of your building, let our Certified Mold Remediation Contractors come evaluate your property to see if you, in fact, have hazardous black mold growing in your home or business. Containment – To ensure black mold spores won’t contaminate other parts of your home, we’ll set up a containment barrier, put the infected area under negative pressure, and then filter the mold spores using an air scrubber. Water extraction – Black mold growth is normally a sign of a water leak or exceptionally high humidity. We’ll use equipment such as water extractors, air movers, and dehumidifiers to bring the moisture levels in your building down to acceptable levels, so the mold won’t simply return after we complete your black mold removal project. Cleaning and removal – We’ll use an EPA-registered, low-VOC advanced peroxide cleaner and a powerful hospital-grade disinfectant called SHOCKWAVE ™ to clean mold off of any affected areas. We’ll also safely remove any building materials that have been too damaged to salvage. Reconstruction – The craftsmen on our staff can even rebuild or replace any sheetrock, baseboards, framing, or other surfaces that were scrapped during the black mold removal process, sparing you from having to seek out another contractor to complete the work. Contact the mold experts at Abatement Solutions Inc. today for black mold removal services that can make your Atlanta, GA, home or business a healthy environment once again. Also, ask about our black mold prevention services, which can protect your building against future contamination.